Hooters Chicken wing sauce is a wonderful wing sauce. While you may have to provide you own Hooter’s girls, you can make Hooters Chicken Wing Sauce just like the restaurant does. When your wings are done, coat them in this sauce and serve. Yield: approximately 2 1/2 cups of hot wing sauce. 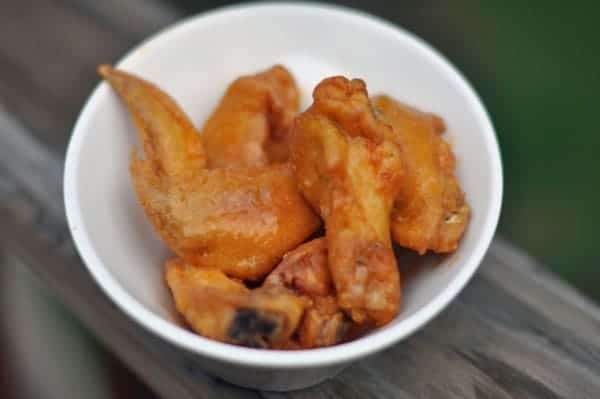 Hooters Chicken Wing sauce is so easy to make. While this recipe is a great tasting and different… definitely not the classic Hooter wing sauce? Maybe you were trying to copy a sweet sirachi sauce or something? This is/was a sauce they would serve in a bottle on the table. It was not the buffalo sauce. Use the butter and Frank’s hot sauce.. not absolutely perfect copy but damn good and easy.. a lot more realistic than the cluster fk used here for a so called copy.. and guys usually do pretty good.. what happened??? That’s what is was thinking Mike! Franks and butter. That’s it. But this is sauce for DIPPING the wings in, not Marinating them in ???? Stephanie is so chilled. Great recipe…. Totally agree… one could come much closer to the actual recipe by copying the ingredients label off an actual jar of hooters hot sauce!! The OP’s recipe is not good! I love this sauce. I make it alot. It’s addictive. I don’t care if it’s not exactly the same as Hooter’s, I think this is better. Thank You So Much FIR Your version. I love ir!!! One stick butter softened, 8-10 tbsp hot sauce, 1-2tbsp flour, 1/4tsp garlic powder and 1/4tsp onion powder. Boom. Now I have it whenever I want it. Definitely doesn’t taste like Hooters wing sauce, the balsamic vinegar was a miss, and I am pretty sure the brown sugar and chili sauce is too. I tried it, I am not sold, I will look else where to find the right mix.